This cemetery will have in-ground burial space available to accommodate casketed and cremated remains when it opens. Burial in a national cemetery is open to all members of the armed forces who have met a minimum active duty service requirement and were discharged under conditions other than dishonorable. A Veteran’s spouse, widow or widower, minor dependent children, and under certain conditions, unmarried adult children with disabilities may also be eligible for burial. Eligible spouses and children may be buried even if they predecease the Veteran. Members of the reserve components of the armed forces who die while on active duty or who die while on training duty, or were eligible for retired pay, may also be eligible for burial. For more information visit our eligibility web page. The new 318-acre cemetery in Mims, Fla., will serve the burial needs of more than 163,000 Veterans in the cemetery’s service area for the next 100 years. Seasonal Holiday Adornments such as Christmas wreaths, potted poinsettias and other seasonal items may be placed on graves from Dec. 1 through Jan. 20. The Department of Veterans Affairs (VA) purchased the land in July 2012 for $2.1 million. The initial phase of construction will provide for approximately 17,000 gravesites and accommodate both casket and cremain interments. 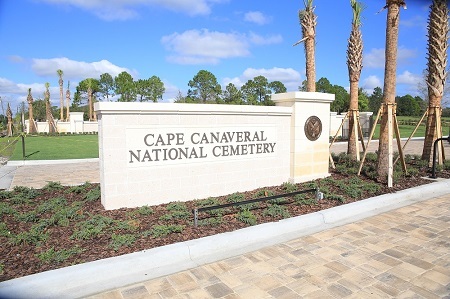 In addition to gravesites and columbaria, the cemetery will include other features such as a front entrance on U.S. Route 1, a public information center with an electronic gravesite locator and restrooms, an administration building, a maintenance building, a flag pole assembly area, a memorial wall with ossuary and walkway, and committal shelters. Other cemetery infrastructure features will include roads, landscaping, utilities, and irrigation.